Her får du et hurtigt overblik over, hvad der er ledigt i jeres ferie, og som matcher jeres ønsker. Er der for mange hits? Så lav en avanceret søgning og indsæt nogle flere kriterier – f.eks. en ønsket kategori eller restaurant. Bemærk, at mange af vores ferieboliger har fast skiftedag om lørdagen. Listen opdateres så ofte som muligt, men den skal kun tages for retningsgivende. Det er muligt at reservere gratis i 24 timer. OBS – ikke alle ferieboliger er med i denne oversigt. Forhør nærmere på inge@localliving.dk, hvis du ikke finder det helt rigtige. Luxury villa for 11-12 people. Very beautiful villa of 250 m2 close to Cortona. Here you find peace and quiet in amazing surroundings. Big pool with view. Country resort with 16 apartments in modern version of Tuscan style. The apartments all have own terraces or loggias. Restaurant that serves breakfast and dinner on the terrace next to the pool. Homemade food. Rental of bikes and golf training area. 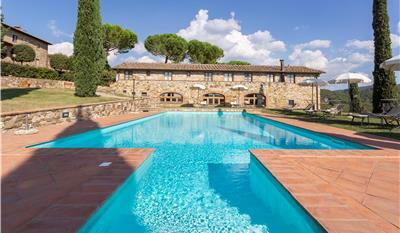 Large villa for 8 people located just 15 minutes from the village of Ghizzano. Beautiful surroundings and lovely pool area. Nice family owned Umbrian country house with 6 apartments in different sizes (2-7 people), Perfect for families with children. Lovely pool and shared outdoor areas with plenty of space and activities for both young and older children, all located in a peaceful and beautiful nature. Between Lucca and Florence are these 14 charming holiday apartments - if you need silence, peacefullness and lots of privacy, Fattoria di Pietrabuona is the right choice for you. Privat and personal decorated villa to 4 persons in the middle of the green hills close to Cortona in Tuscany, but still close to wonderful places in Umbria. Il Paluffo an ecological country house with care for the environment. 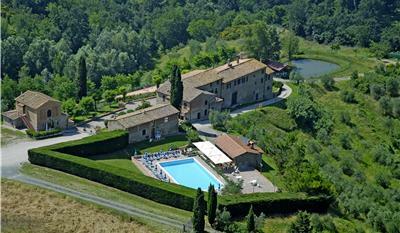 Stay in this beautiful place amidst the Chianti hills, you will find 4 Tuscan apartments of different sizes. Between forest and 12 hectare of olive groves do Tenuta della Selva offer you welcome. Here are 7 light apartments, pool and many options for activities which the place can help you with. Ville Femar is only 300 meters from Cortona, which has restaurants, weekly markets and exciting architecture. The villa have room for 4 people, spread over 2 floors with a large terrace and a private pool with a beautiful panoramic view. The farm house consists of 10 apartments and is situated in a beautiful spot where you will quickly feel relaxed and in harmony. Lots of hills covered with vine and olive trees just outside the terrace and as far as the eye can see. Bicycles and table tennis. Close to Andrea Bocellis birthplace. Villa Massimo is a brand new villa for up to 9 people. 3 rooms. Private pool. Lajatico in Tuscany. Our holiday homes in Italy are ranging from simple to luxury and we cover almost any type of holiday. You see here our most popular accommodation so this might be a good place to start. The most popular holiday homes happen to be situated in Tuscany and they are characterized by good standard, pleasant owners and value for money.